Where should I park? What’s the easiest way to get there? Most of the Charlestown parking near Courageous is metered or resident parking, so your best bet is is to park at the Nautica Parking Garage (88 Constitution Road, 02129). Remember to ask the Courageous Front Desk to validate your ticket; rates are typically $7-$11 with validation. Make sure to allow an extra 15 minutes to stroll through the Navy Yard to Pier 4, and take a look at the map so you know where to walk. From the Nautica, leave the water and piers on your right and walk into the Navy Yard. Pass the Constitution Museum on your right, then Pier 3 (where the MBTA ferry leaves from). Turn right at the next pier, walking along the U-shaped inlet of water on your right and a park on your left. 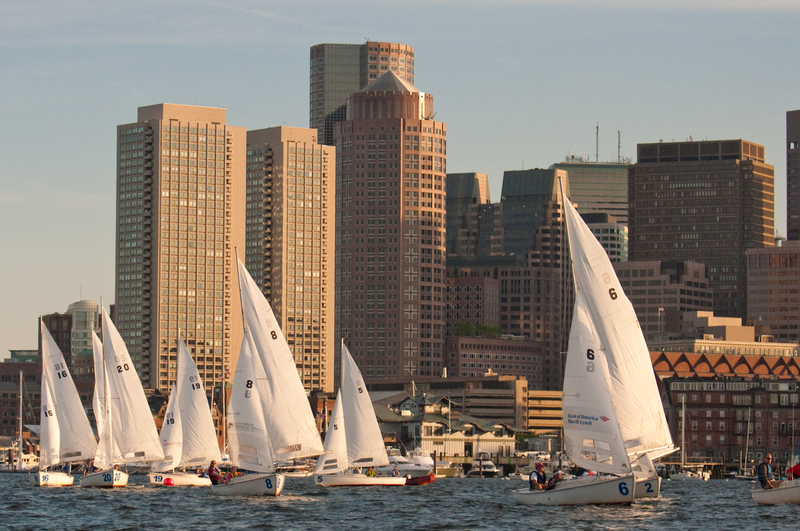 Walk past the round brick building and onto Pier 4–you’ll see the masts of our boats on the left of the pier. Go to the left side of our boathouse, which is a little white building with a flag on top. You may also park at the Flagship Wharf Garage (197 8th Street, 02129), which is closer but more expensive. Street parking is an option if you’ve got extra time to look for it. There are 2-hour metered spots on 1st Street (free and unlimited on Sundays), free Sunday parking in residential spots on the far side of Chelsea Street, and very rare free spots on Terry Ring. No guarantees on this information–make sure to check the signs!! Do not park on any of the piers, including Pier 4. 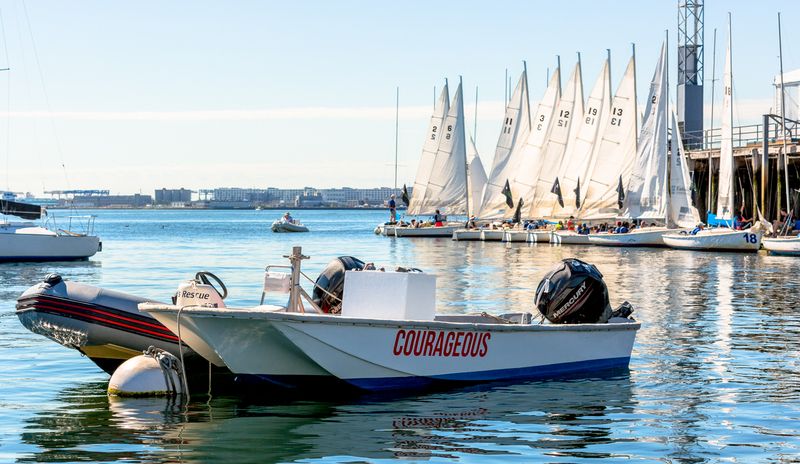 Public transportation is also available (Green Line, Orange Line, 93 bus, or the MBTA ferry from Long Wharf to Pier 3), and biking is the perfect way to get to Courageous. Please check our website for more information and a map. Please arrive at Courageous about 10 minutes early, and check in at the Front Desk. Make sure to allow extra time for parking and the walk over. If you’re running late, please give us a call and let us know. If you arrive late for a 2-hour sail, we may not be able to give you the full two hours. What should I bring? What should I wear? What about food? Bring a water bottle, sunscreen, and a few extra layers, including a waterproof jacket. Sunglasses and a hat are good ideas, too. Cameras/phones are welcome–we love to be tagged in photos. If you’ve bought an online deal, make sure to bring your voucher code if you haven’t provided it already. Feel free to bring snacks or lunch. Coffee, snacks, and sandwiches are available at several locations near Courageous. Our full-day weekend courses incorporate a half hour lunch break. You may leave to purchase lunch, or bring your own; our refrigerator is available for the use of members and students. You’re also welcome to use our grills and bring beer or other drinks to enjoy after sailing (no alcohol before or during sailing). We often host cookouts for members, students, and racers on weekday evenings (Saturdays in the fall)–feel free to join in. Dress comfortably–jeans and sneakers are just fine. Wear a few layers, since the weather is often hotter or chillier than you expect, and bring an extra layer or two. We recommend wearing closed-toed shoes with good traction and non-marking soles, such as sneakers or boat shoes–no flip flops or heels. Life jackets are provided. What if there’s bad weather or strong wind? Well, that depends on what you mean by bad weather. 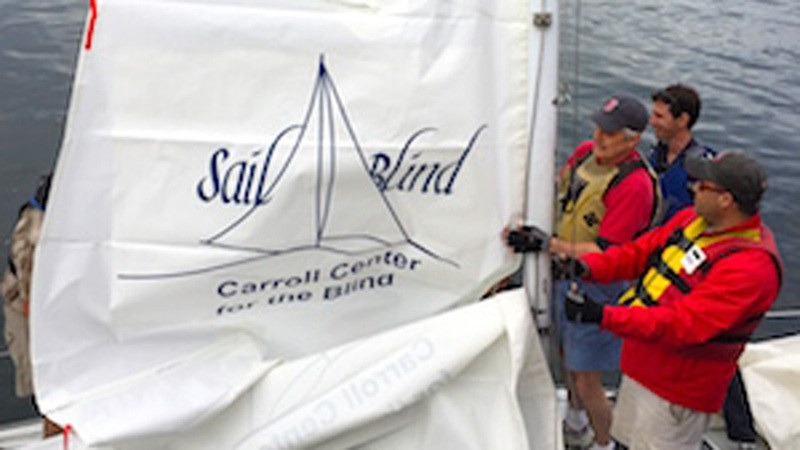 Sailing is fun even when the weather isn’t perfect, and we can’t guarantee sunny days for everyone. So if it’s overcast or raining a bit, we will sail (we have raingear you can borrow, if necessary). We monitor the radar and wind speed closely, so that we can predict when heavy rain or unsafe conditions are likely to pass through. 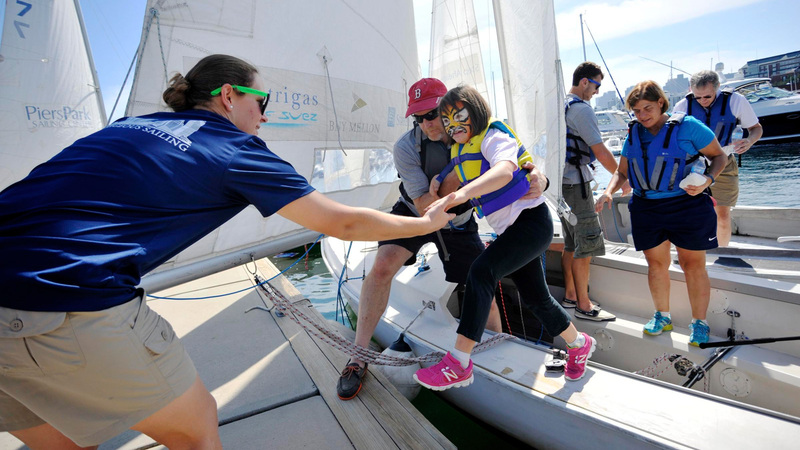 2-hour sails and private lessons: If Courageous decides to cancel due to likely thunderstorms, heavy rain, dangerously strong winds, or any other reason, we will reschedule your 2-hour sail or lesson free of charge. If the weather is looking bad, give us a call before heading to Charlestown if we haven’t contacted you already. Courses: We almost never cancel a full day of our courses, as the curriculum includes plenty of onshore material that can be covered when the conditions aren’t safe to sail. 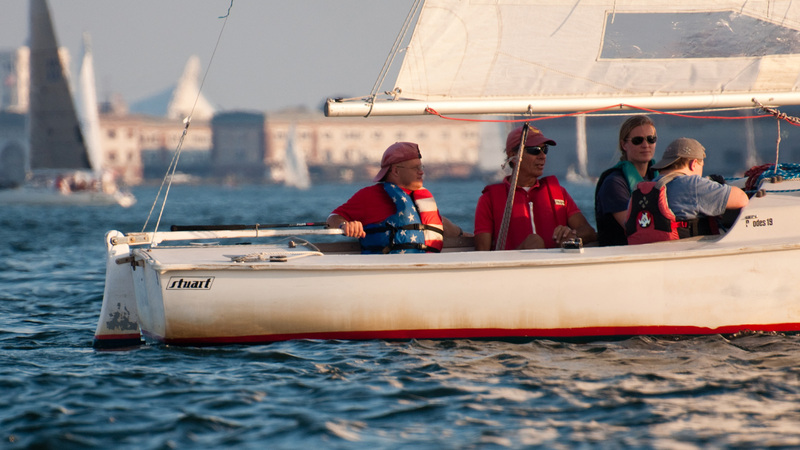 How will I know if my course is canceled or there are restrictions on member sailing? If your course is canceled, we’ll send out email notifications to students by approximately 8:30 AM, as well as posting an alert on our homepage. If you’re concerned about the weather and need notification before 8:30, please let us know a day in advance. It’s always a good idea to check the Courageous homepage for weather alerts and restrictions before heading over to Pier 4, especially if you’re a Red or Yellow Flag skipper–sometimes it’s windier than you realize! Alerts are usually posted half an hour before we open, and may change throughout the day. If you’re a member who’s not sure if you’ll be allowed to sail (or if you WANT to sail! ), give us a call and we’ll give you the latest scoop on the wind and radar. As long as you give us 48 hours notice or more, rescheduling or canceling is no problem at all, just give us a call at 617-242-3821. If you need to reschedule or cancel within 48 hours of your lesson, we will try our best to accommodate, but cannot guarantee availability. Cancellations within 48 hours, that are not weather related, are subject to a $60 cancellation fee, and no refunds shall be offered. All courses must be scheduled within the calendar year of purchase, and no refunds shall be offered. Students may reschedule up to 2 weeks before the start of their course. Within 2 weeks of the scheduled course, the booking may not be rescheduled and no refunds shall be offered. Students must attend all dates of their selected course. If a day is missed, it is the student’s responsibility to schedule make-up sessions. Private lessons may be purchased for this purpose at the discounted member rate. If Courageous cancels all or part of your course due to weather or any other reason, we will do our best to reschedule at a convenient time for the students. What kind of boat will I be sailing? Could we capsize? Will I get wet? 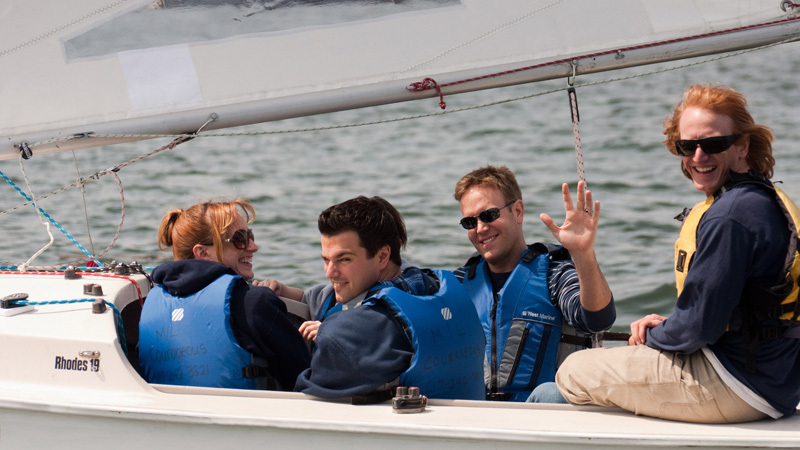 For our 2-hour sails and most of our courses, you’ll be sailing a Rhodes 19. Rhodes 19s are keelboats, which means that there is a big heavy metal fin on the bottom that prevents the boat from capsizing. On windy days, you may get a bit wet from the spray, but there is a compartment where you can stow items and keep them dry. What should I do with my belongings and valuables? Your cellphone will fall out of your back pocket! Make sure it is zipped into a safe place. If you’d like to store your valuables on land, we can hold them for you behind the Front Desk. The boats are usually dry enough to bring your bag, etc. along with you–just stow your things in one of the side bins. If you’d prefer to leave your things ashore, bring a lock and use one of the lockers in the hall on the way to the bathrooms. Please don’t leave your belongings out in the boathouse or in an unlocked locker, or leave anything overnight. 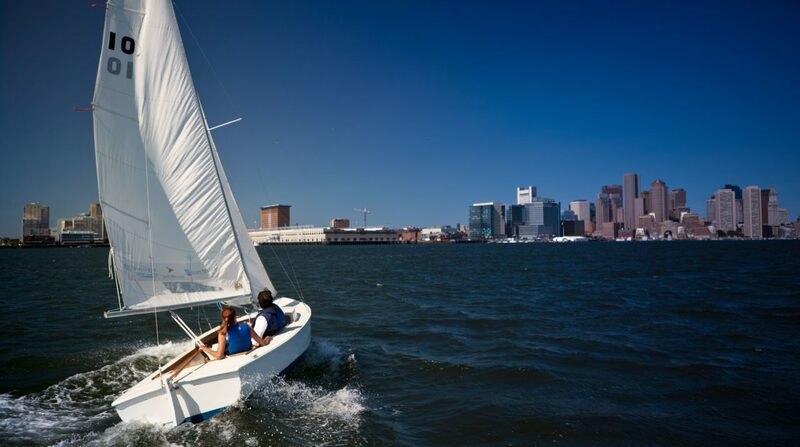 When is the best time to sail on Boston Harbor? Some of the best sailing of the year is in May, June, and September…and don’t be afraid to book a course or 2-hour sail in October! We love fall sailing because the harbor tends to be less crowded, the wind is often excellent, and a warm jacket is all you need if it’s chilly. The hotter months in July and August are great too, but prone to lighter winds and the occasional thunderstorm. How can I buy sailing gear or Courageous merchandise? Courageous offers 20% off Gill sailing gear; just ask at the Front Desk for a catalogue. Gear can be embroidered with Courageous’s logo. 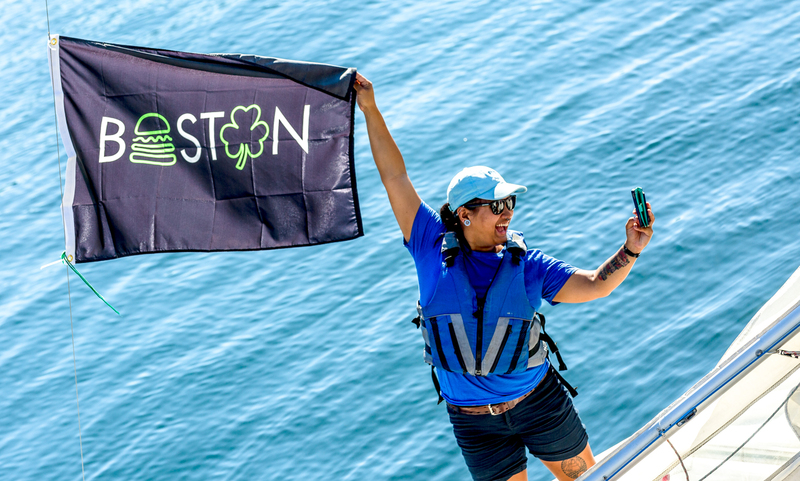 Sailing gloves, charts, drybags, and Courageous T-shirts, hats, jackets, floatable keychains, water bottles, and more are also for sale at the Front Desk, subject to availability. If you have any questions about buying gear locally or online, our staff will be happy to give you advice. Of course! Courageous is a great place to sail with kids. We have a variety of life jackets for children and babies. There must be one responsible adult per child under the age of 12 (in addition to the instructor), unless you’ve discussed it with us in advance. Can pets sail at Courageous? Chill pets are welcome, but you must bring a (pet-specific) life jacket for them. Please keep your dog on a leash, and be aware that there are often other dogs here. If you and/or your pet are fairly new to sailing, a 2-hour sail probably isn’t the best time to bring your pet on the boat. I loved my 2-hour sail! 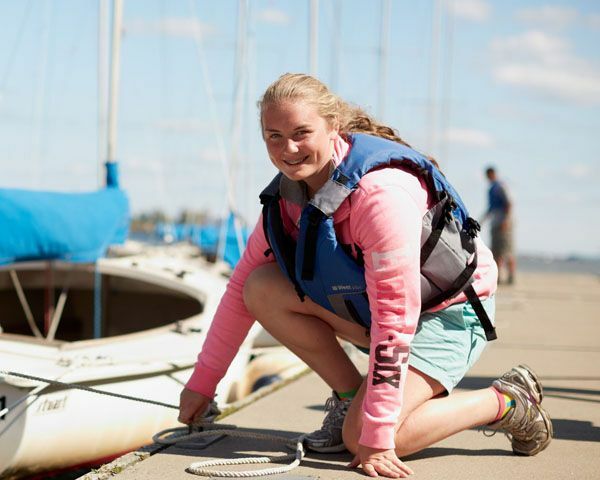 How can I keep sailing? Great! Courageous makes it easy. 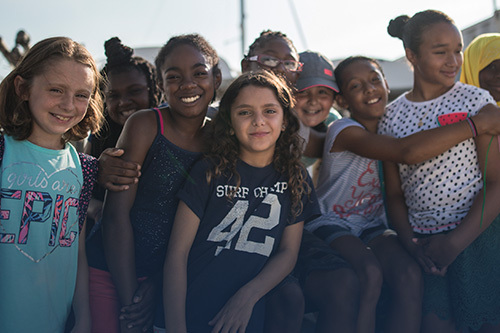 If you are new to Courageous and decide to sign up for a course or membership after your sail (whether purchased through us or through an online deal), we’ll be happy to give you a 15% discount off of one item. Check out our courses and membership options. Please contact us directly within one week of your two-hour sail to take advantage of this offer.